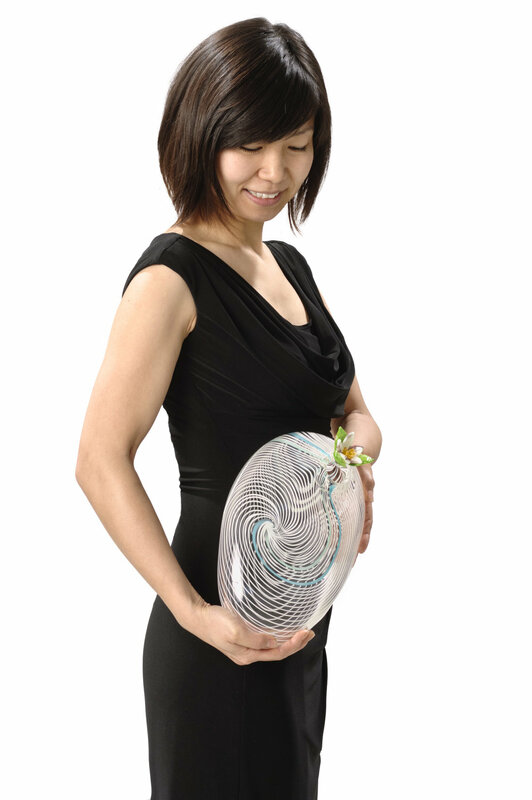 Yuri Okamoto’s blown glass sculpture seamlessly combines the traditions and aesthetics of two distinct cultures, demonstrating both a deep reverence for long-standing Italian glass making techniques and a profound respect for Japanese culture and design. Inspired by the beauty of Japanese gardens, the forms and textures of Okamoto’s sculptures are simple, designed to be reminiscent of stones, ponds, or raked sand. 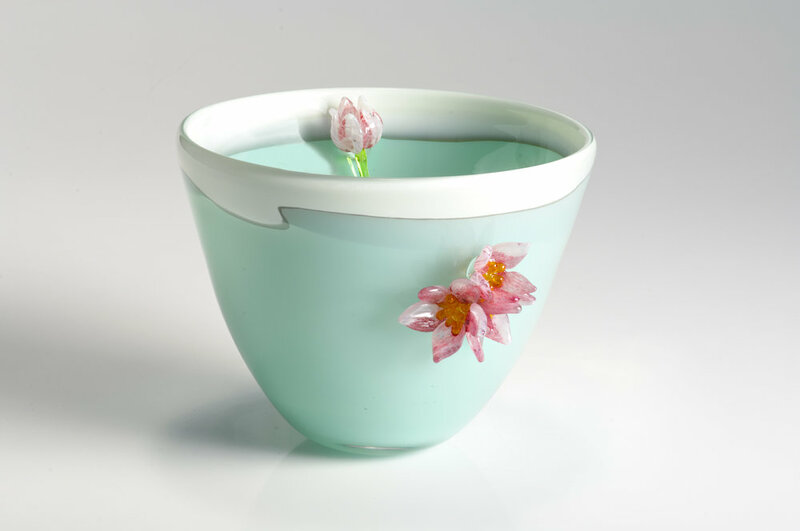 The surface of each of her graceful, modest forms is adorned by delicate, intricately sculpted flowers, with cherry blossoms, camellias, and water lilies each conveying a different mood. In Japan, cherry blossoms represent new beginnings. People celebrate the New Year with parties thrown under their beautiful pink blooms. When I first began sculpting flowers in glass, I was mostly interested in color and form, not really trying to represent any specific flower. But after taking a course with Karen Willenbrink-Johnsen, who encouraged me to make “make it real,” I decided that cherry blossoms would be a good place to start. Since then, I have begun to explore the forms of other flowers that have personal meaning for me. I remember being fascinated by water lilies when I visited a Japanese garden as a child with my grandmother and her friend, and now that I live in Indiana, spring is marked by the bloom of Dogwood trees. I have recently begun to think of my work in more sculptural terms, moving from using a vessel as the central structure of my work to simple, blown forms designed to suggest the shapes of leaves. These pared back forms are meant to honor traditional Japanese values, and express a sense of gratitude for natural resources, including those required to make this work, and a sincere desire to avoid being wasteful of these resources. Glass is a fascinating material, and I am always working to improve my skills and master new techniques. I have recently started to explore the more detailed effects that can be achieved by creating the flowers in the flame-working studio ahead of time, rather than sculpting them in the hot shop. 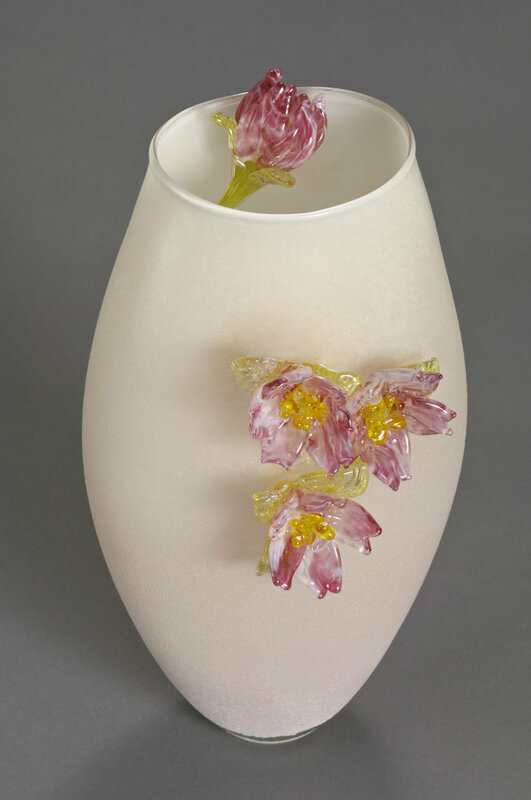 The final piece is still assembled hot, however, by reheating the flowers and attaching them to a glass sculptural form using a hot torch during the blowing process. Every day is a different relationship with glass. Some days we fight, but some days we’re good friends.